Gail Carriger LLC, 9781944751197, 422pp. New York Times bestselling author Gail Carriger brings you a charming stand alone story set in her popular Parasolverse. The monsters left Faith ruined in the eyes of society, so now they're her only option. Faith crosses the Atlantic, looking for a marriage of convenience and revenge. But things are done differently in London. Werewolves are civilized. At least they pretend to be. Backward heathens with no culture, Major Channing has never had time for them. But there's something special about Faith. Channing finds himself fighting to defend his species and his honor (what little he has left). But this werewolf has good reason not to trust human women. 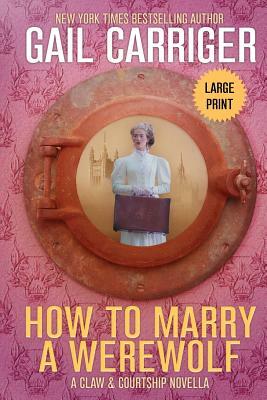 Don't miss this charming story from the author of the Parasol Protectorate books. Look out for appearances from favorite characters and the serious consequences of unwarranted geology. The Claw & Courtship novellas can be read in any order. This book can be enjoyed without having read any of Gail's other works. Set in the spring of 1896 this story occurs after events chronicled in Romancing the Werewolf and concurrent with those in Reticence. Want more hot gruff werewolf gentlemen and practical tough ladies? Try Soulless.